Members enjoy great music, spectacular theatre organs, and keep an active social schedule of fun events throughout the year. Learn about joining our group! The one-man band. A thrilling sound that sends chills down your spine. 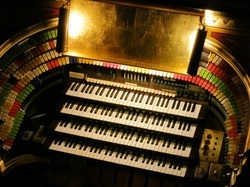 Mighty theatre organs are some of the most versatile musical instruments. Designed to accompany the silent films of the 1920s, they can effectively play a myriad of music styles. From Gershwin to Sousa and Stravinsky to the Beatles, there's almost nothing they can't tackle. And nothing is better for accompanying Charlie Chaplin, Laurel and Hardy, Harold Lloyd, or the other greats of silent cinema! Click here to read more about us and the theatre pipe organ. These instruments were only made, with few exceptions, in the 1920s. Since that time, enthusiasts have flatly refused to let the theatre organ leave the limelight. George Wright sold millions of "HiFi" records in the 1950s that ignited a new generation of theatre organ fans, and the American Theatre Organ Society has nourished a continued commitment towards presenting great organists on great organs, hosting educational camps and programs, and offering a unique network of individuals passionate about the many aspects of the theatre organ: musical, technical, and more! Click here to see a list of our upcoming events. We hope you'll join us! On Saturday, February 23 at 3 p.m., hear the 1927 Grande Page theatre pipe organ like you've never heard it before! Tedde Gibson not only brings the best in pops to his concerts, he also features great jazz stylings, inspirational gospel, and a fresh new way of presenting great music. As a bonus, the award-winning Stephenson High School Concert Band will also perform, under the direction of Quentin R. Goins. Tickets are on sale now - $15 in advance, $18 at the door, and students admitted free. Click here to purchase. It's that time of the year again - time to renew your ATOS Atlanta membership and help us to continue to preserve and promote the theatre organ. This year it's easier than ever! Simply head over to the membership page and renew online via PayPal or credit card. Of course, you can always renew in person at one of our monthly meetings or via postal mail with a check. Not currently a member? Come out to one of our programs and experience the magic of the mighty theatre organ and consider joining our efforts!